KPAM 860 AM radio will raise money to benefit military families from Mov. 26 to 30. A holiday fundraising tradition for the families of military members is continuing again this year on KPAM radio. The weeklong fundraising drive starts on Monday, Nov. 26. 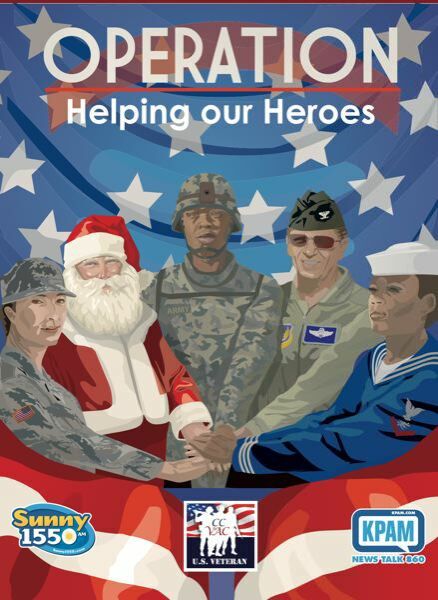 Now called Operation Helping Our Heroes, it originally began 15 years ago as Operation Santa Claus when the station was owned by Dr. Robert Pamplin, the owner of the Portland Tribune and Pamplin Media Group. It is being continued under the current owner, Salem Media of Oregon. The on-the-air drive was started by KPAM host Bob Miller, who was upset that while our troops in Oregon and Southwest Washington were away protecting and fighting for our freedom, their loved ones were struggling to make ends meet at home. Each day was dedicated to telling stories about the situations of the families who stayed home, talking to folks who have been helped and sharing the need with KPAM's listeners. Miller and the station recruited volunteers who took calls from listeners who wish to donate. Many of the volunteers were military folks who supported the initiative. That tradition will continue this year. The drive has raised more than $1.9 million over the years. Until 2017, it benefited the Salvation Army. Last year and this year, it benefits the Clark County Veterans Assistance Center, which helps military families pay for utility bills, rent, medical need, food, car repairs, transportation and other items. The organization received over $100,000 last year and has documented how all the money is spent. The call line is 503-239-HELP (4357) from Nov. 26 to 30.